We’ve thankfully received some much needed rain this season. But after several years of drought, our state continues to face a water shortage. I know California’s drought is hurting many Sacramento County families, farmers, and small businesses. Our drought has to be about people, not politics. That means providing emergency help to everyone who needs it and doing all that we can to diminish its impact on our economy. It also means not pitting one California region or party against another. That includes not placing southern delta interests ahead of Northern Californians’. Our drought has to be about people, not politics. In Sacramento County, I’ve met with families, farmers, and small businesses that are struggling because of the drought and need help. I’ve heard from small business owners who rely on our water supply. I’ve met with farmers who are having a tough time growing their crops because they don’t have enough water. And I’ve met with families that have spent significant time and money to re-landscape their yards to help save water. People in our region are pitching in and doing their part to conserve water and help with the drought. Our local, state, and national leaders have an obligation to do their part to make sure those struggling because of the drought can get the help they need. Connecting Our Area With Drought Relief: I’ve directed my local office to do all it can to help residents who need drought relief. That includes connecting families with rebates for saving water, disaster aid for farmers, and emergency help from the Small Business Administration. We'd be honored to help you, too. Please feel free to call my office at (916) 635-0505 or visit my Drought Relief web page to see how you can get help. At a drought relief workshop my office held for local residents in 2015. Voting For Further Drought Relief: We also need to make sure emergency help continues to be available for those who need it most. That’s why I voted for a bipartisan government funding bill in December 2015 that is now law. This legislation includes another $100 million for the Bureau of Reclamation to provide more drought relief to western states like California. Ensuring Residents Can Take Advantage of Water-Saving Rebates: We should be rewarding California residents for doing the right thing to save water. But thousands of Californians may now face unexpected taxes for re-landscaping their yards to be more water efficient. Alvin, one of my constituents, installed drought resistant plants and landscaping in his yard and used the state rebate to help pay for it. Unfortunately, he received a letter notifying him that he has to pay federal taxes on the state rebate, despite never being warned the rebate would be taxed. Our drought can’t be about pitting one California region or party against each other. We need to work together to address this crisis. That’s why I'm strongly supporting the Drought Relief and Resilience Act. The bill includes both short and long-term solutions to develop new clean water infrastructure in California. It would expand our water supply and create jobs without undermining environmental safeguards, preempting state laws, or helping one area of our state at the expense of another. The bill was developed with input from people all over California. 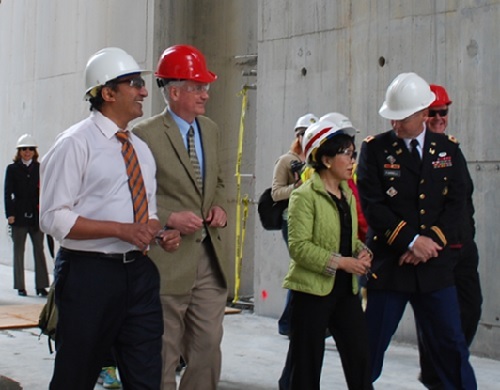 With my neighboring congressional colleague, Congresswoman Doris Matsui, and other officials as we toured upgrades at the Folsom Dam. Modernizing our economy and investing in our future prosperity is about more than rebuilding roads and bridges. It’s also about helping our communities better adapt to changing conditions so we can remain competitive. This is especially true when it comes to improving California’s water infrastructure. Though we’ve thankfully received some much needed rain this season that has provided some relief, our drought continues. We have to continue working to conserve the water we have, but we must also do a better job of capturing and storing water when it rains. This would help us both prepare for dry years and for years when flooding in our area is more of a concern. Upgrading the Folsom Dam: We should invest in our water infrastructure to safeguard our local supply of drinking water and to create jobs. That's why I’ve strongly supported making upgrades to the Folsom Dam since becoming your Congressman. These upgrades are now underway and will allow Folsom Dam to store more water, as well as give it the ability to release water more safely and strategically. These measures will help with our current drought and provide better flood protection during wetter years. This infrastructure project has also already brought hundreds of new jobs to our region and infused tens of millions of dollars into our local economy. It’s a model for our region and the epitome of government collaboration with state, local, and federal agencies to keep the project on schedule and under budget. With Interior Department Secretary Sally Jewell and Congresswoman Doris Matsui to review new upgrades to the Folsom Dam. Building More California Water Storage: We need to take a thorough and comprehensive approach to ensure all California residents can continue to depend on a reliable water supply. While increasing the Folsom Dam’s water storage capacity is important, we can’t stop there. That’s why I support additional storage, including by building the proposed Sites reservoir. This will help us store more water in rainy years and take pressure off of Folsom Lake. Cleaner and Smarter: I’m also supporting the EchoWater project, one of our area’s largest public work projects. This will ensure that water going through the Sacramento region’s wastewater treatment plant will meet higher standards. It also takes steps that will address our drought in the long-term by increasing recycled water use in landscaping and agricultural irrigation. This project is funded in part because of the Clean Water Act’s State Revolving Loan Fund, which I strongly support. Supporting Flood Safety: Though it may be harder to imagine now with the drought, our region also has the second highest flood risk in the country. That’s why I voted for the bipartisan Water Reform, Resources, and Development Act, which is now law. This law authorizes federal support for the Natomas Levee Improvement Project, which would fortify the Natomas levees to help keep our communities safe and it helps create new jobs. Making sure we have enough water at Folsom Lake and other reservoirs so that local families have safe water to drink must be our priority. We shouldn’t unnecessarily send more water out of our area to other regions. But even when Folsom Lake reached record lows in 2015, there were some who continued to push for releasing more water. This is irresponsible. We need to responsibly balance the needs of all Californians, not pit different regions or parties against each other. Stopping the Partisan Water Grab Bill: Since I've had the privilege of serving you in Congress, I’ve consistently opposed a reckless and partisan bill that would send more water out of our area and do nothing to address our state’s water shortage. Sending more water out of Sacramento County to other parts of the state would only make our own local water shortage even worse. Above all, we have to make sure there is enough safe drinking water available to California families. But amazingly, the last time Congress considered this bill was at a time when Folsom Lake was nearing its lowest levels in history. To make matters worse, the risk of contaminating our drinking water continued to grow as water levels declined. Opposing The Flawed Twin Tunnel Plan: The last thing we should do is implement a program that would make our local water shortage worse. That’s why I’ve strongly opposed the flawed plan to build water draining tunnels under the delta. The so-called California Water Fix would require taxpayers to pay billions of dollars to build two enormous tunnels under the delta. These tunnels would send water from our area to Southern California. Since I’ve been in Congress, I’ve opposed the twin tunnel plan. In a coalition with other Members of Congress from Northern California, we’ve repeatedly urged the Governor to reconsider and explain how California taxpayers will pay for this proposal. I’ve also supported legislation to block any federal money from going towards this project. Preventing Unnecessary Water Releases From Folsom Dam: We need more common sense flexibility at the Folsom Dam so it can serve a dual purpose – flood protection for when we need it and extra water storage for drier periods. That’s why I’m working with officials at the Folsom Dam to ensure our local reservoir holds more of the water it has now, instead of releasing water unnecessarily. I’m continuing to work with federal and state officials to be more pragmatic and realistic when releasing water from our local reservoir. I sent an email update on Wednesday about how I'm working for you. Join my email updates now so you don't miss any in the future! Washington, D.C. – Congressman Ami Bera, M.D. highlighted the importance of strengthening drought forecasting in light of recent water releases at Folsom Dam. In his opening remarks to the Administrator at the National Oceanic and Atmospheric Administration (NOAA), Bera discussed the recent water releases from Folsom Lake and emphasized the benefit of better forecasting. RANCHO MURIETA (CBS13) — Jumping at the state’s water rebate program, Alvin Somers ripped out his lawn, and put in drought resistant plants and woodchips. California’s Save our Water program rewarded him with a check for $1,300. “The idea was terrific,” Somers said. The State offered rebates of up to $2,000 to put in drought resistant landscaping. Several cities, including Sacramento and Los Angeles have similar programs. I sent an email update on Wednesday about my recent work in Sacramento County. Join my email updates now so you don't miss any in the future! FOLSOM LAKE (CBS13) — Rep. Ami Bera toured the low levels at Folsom Lake, walking through areas that should be underwater. “You can see the pictures and so forth but when you’re actually standing in the lake and seeing how low the water level is it really is dramatic,” he said. Recent rain has provided a little leeway, but it’s clear there’s still a long way to go. “We may have a very wet winter but if we don’t have dramatic snowfall and so forth we’ve gotta still be conscious we’re still living through this drought,” he said. I sent an email update on Thursday on how I've been working for you these past few weeks. Please join my email updates now so you don't miss any in the future! I sent an email update on Wednesday on how I'm working in Congress to improve our response to wildfires. Join my email updates now so you don't miss any in the future! My office is holding a Drought Resources Workshop on August 21st to connect local residents with help they may need. Local water districts, the United States Department of Agriculture, the Sacramento Tree Foundation, and other organizations will be there to offer resources and drought help. I sent an email update about I fought against partisan water grab bill that would make our local water shortage even worse. I also gave an update about how I'm working to address our drought in a more thoughtful and comprehensive way. Join my e-mail updates now so you don't miss any in the future! Instead of partisan water grabs, we need to focus on real solutions. That’s why I’m supporting the Drought Relief and Resilience Act – a comprehensive approach to California’s drought. Learn more about it by viewing this infographic or by reading the press release.